These pages can be used to post fees not posted by the Tuition Calculation process, like PE T-Shirt, CCA Fund etc, to the student's account. This process can charge fees to be posted for each of the individual students. This function will be used to post fees manually to the student account. This function doesn't need any approvals. 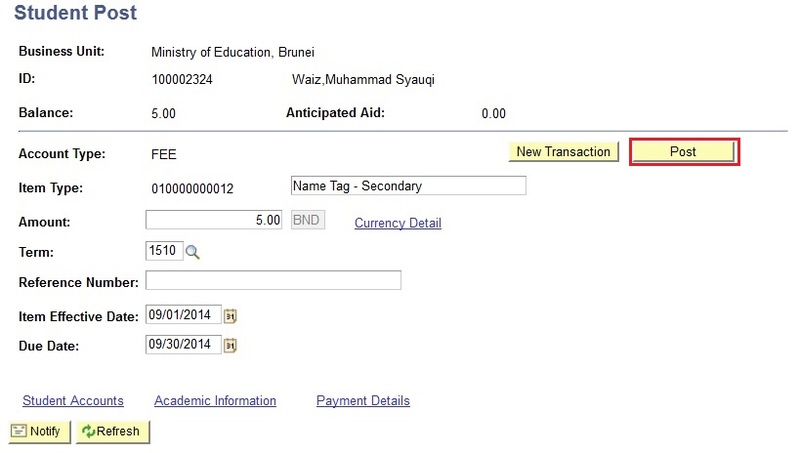 Navigate to Main Menu > Student Financials > Tuition and Fees > Charges and Payments > Post Student Transactions. 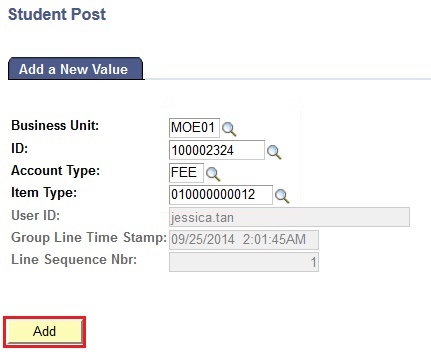 In the Add a New Value tab, enter the values in the Business Unit, Student ID, Account Types and Item Type fields. 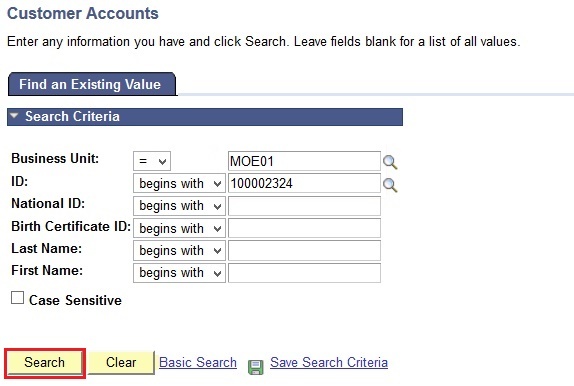 Note: Make sure the required fields are not empty: Business Unit, ID, Account Type and Item Type. Click the Add button next to continue. 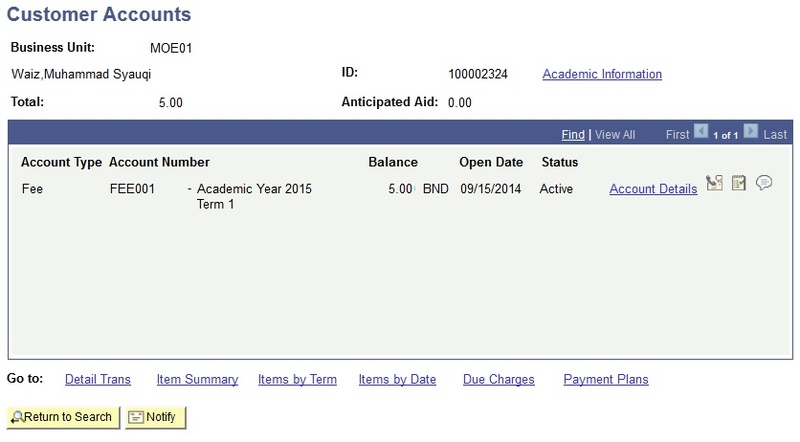 You will be directed to the Post Student Transaction page. Enter the required values in the Amount, Term, Item Effective Date and Due Date fields. New Transactions: Click to enter a new transaction. Post: Click to post the entered transaction. Amount: Enter the item amount. Click the Currency Detail link to specify the exchange rate. Term: Enter the term for which you want to post this transaction. Reference Number: Enter an optional reference number to track the transaction. Item Effective Date: Enter the date on which the transaction becomes active. The default is the current date. 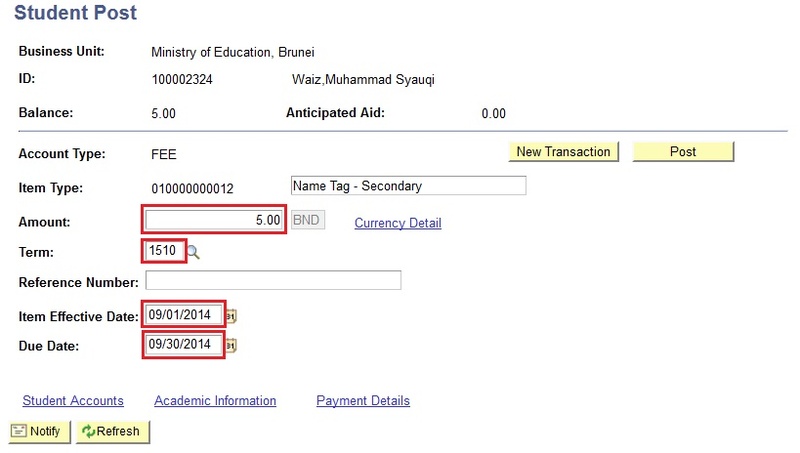 Due Date: Optionally, enter a due date if the transaction is a charge. Student Accounts: Click this link to access the Student Accounts page. Academic Information: Click this link to access the Academic Information page. 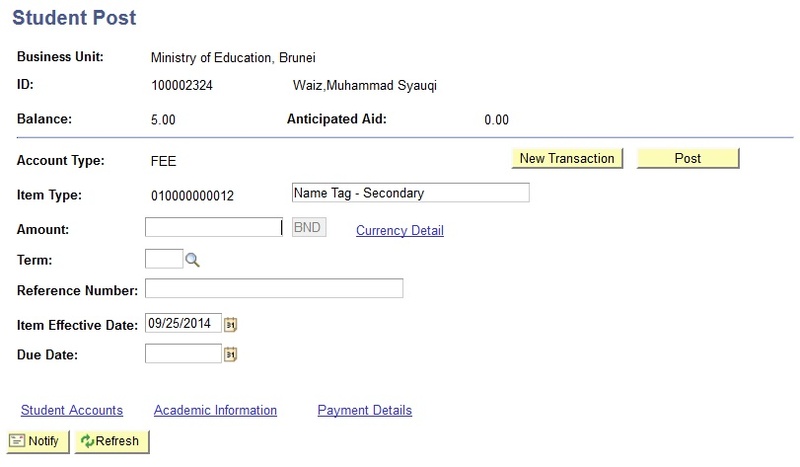 Payment Details: Click this link to access the Payment Details page. Note: Make sure the required fields are not empty: Amount, Term, Item Effective Date and Due Date. Note: Once posted, all the fields will be greyed out. Click in the Post button. 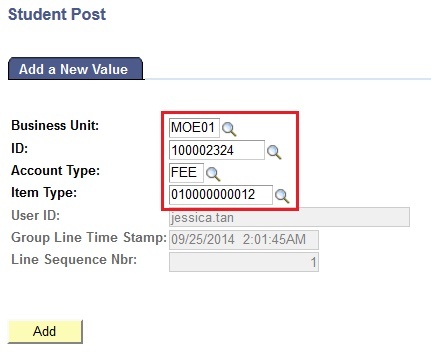 In the Find an Existing Valuee tab, enter the values in the Business Unit and Student ID field.